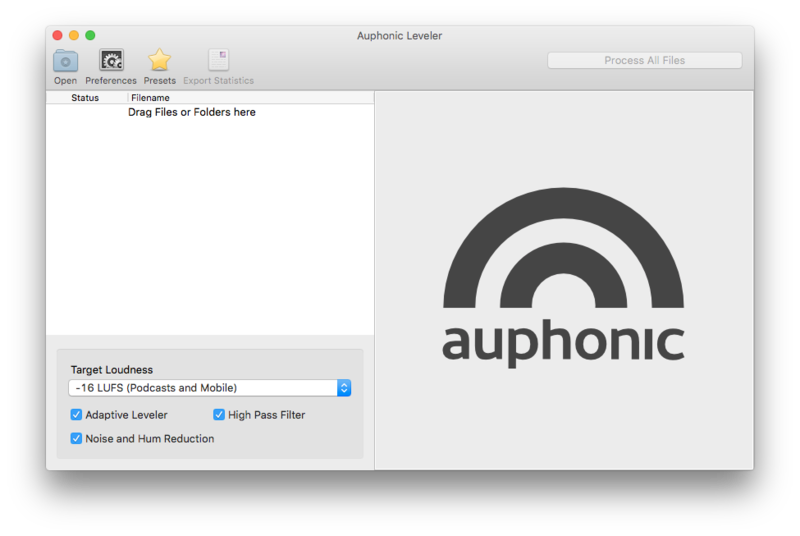 Please go to the Auphonic Leveler Batch Processor Page to download a demo version and to see our current licensing options. For more details and audio examples see Adaptive Leveler. 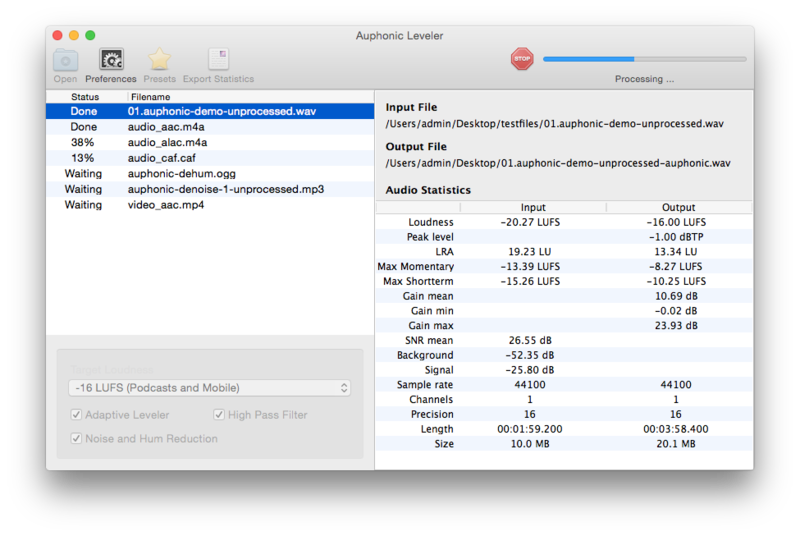 For details and audio examples see Global Loudness Normalization. For more details see Adaptive Filtering. 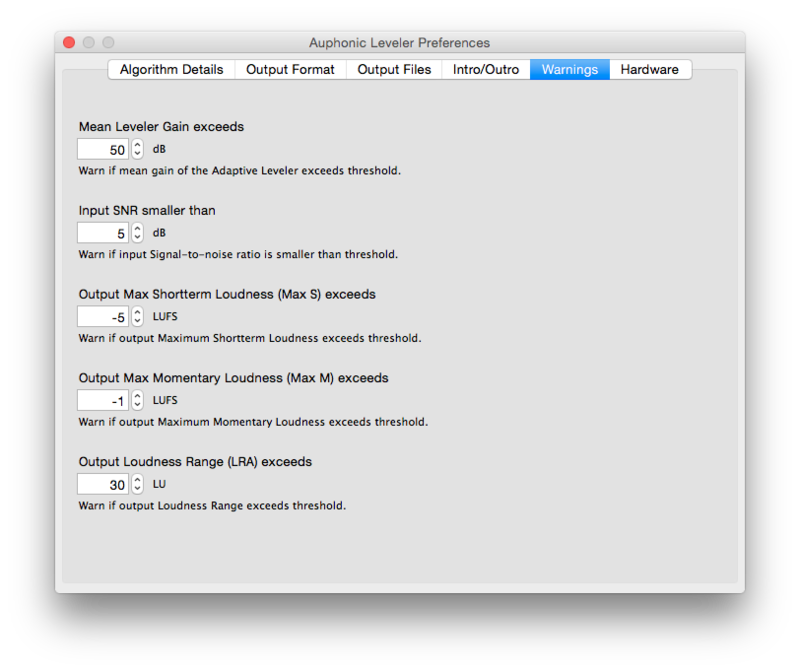 It is also possible to setup Warnings for quality control or as alerts to manually check problematic segments in your audio: for example, you don’t want a MaxMomentary loudness >= -19 LUFS or an Input SNR <= 15dB. Warnings will be displayed in the application and are also exported to processing statistics files. Below is a list with descriptions of all available parameters and screenshots. If you don’t know what that means, please leave it at the default values! Noise and hum reduction amount in dB, higher values remove more noise. 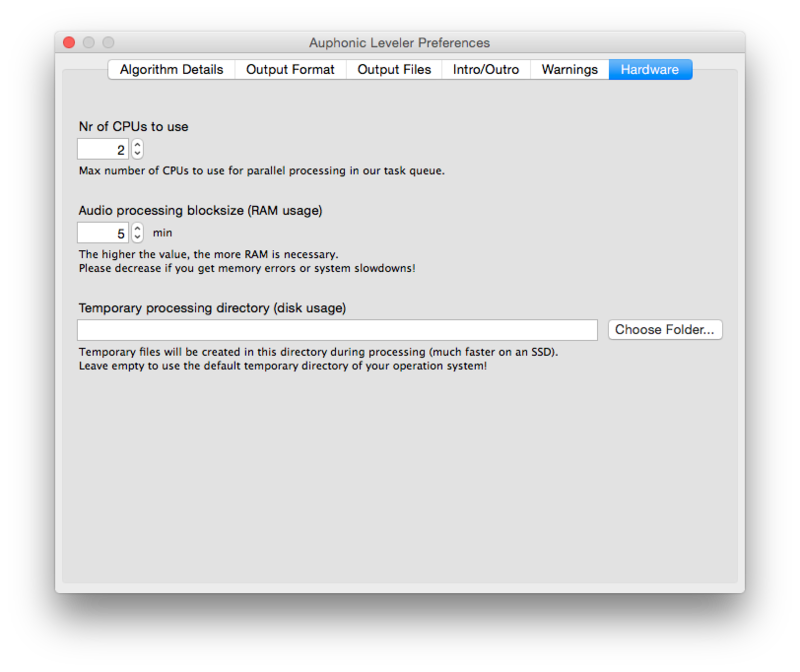 In Auto mode, a classifier decides if and how much noise reduction is necessary. Maximum true peak level of processed output files. 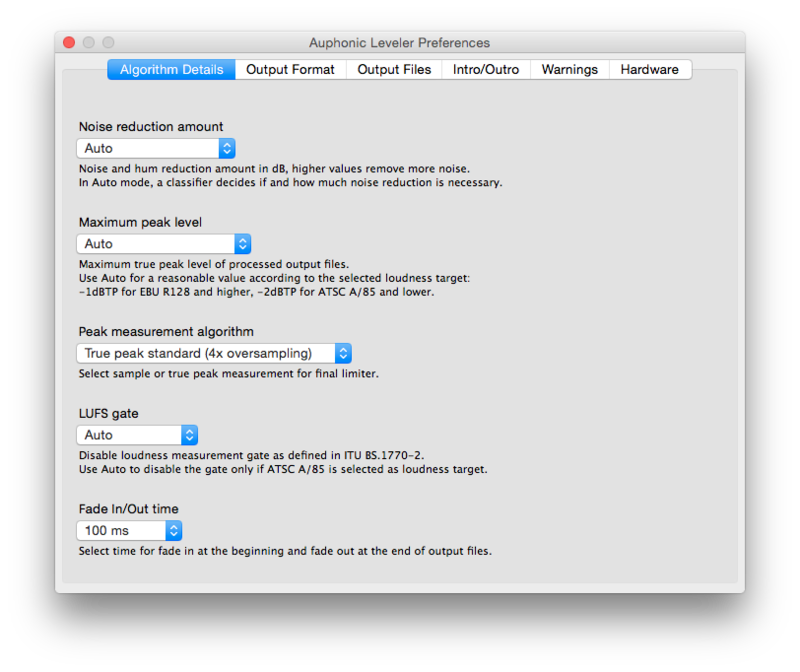 Use Auto for a reasonable value according to the selected loudness target: -1dBTP for EBU R128 and higher, -2dBTP for ATSC A/85 and lower. Select sample or true peak measurement for final limiter. 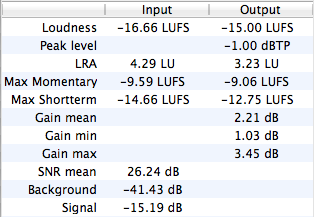 Disable loudness measurement gate as defined in ITU BS.1770-2. 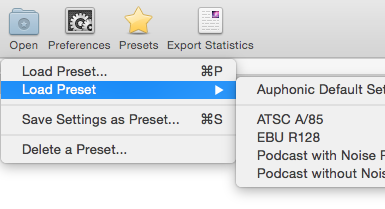 Use Auto to disable the gate only if ATSC A/85 is selected as loudness target. Select time for fade in at the beginning and fade out at the end of output files. 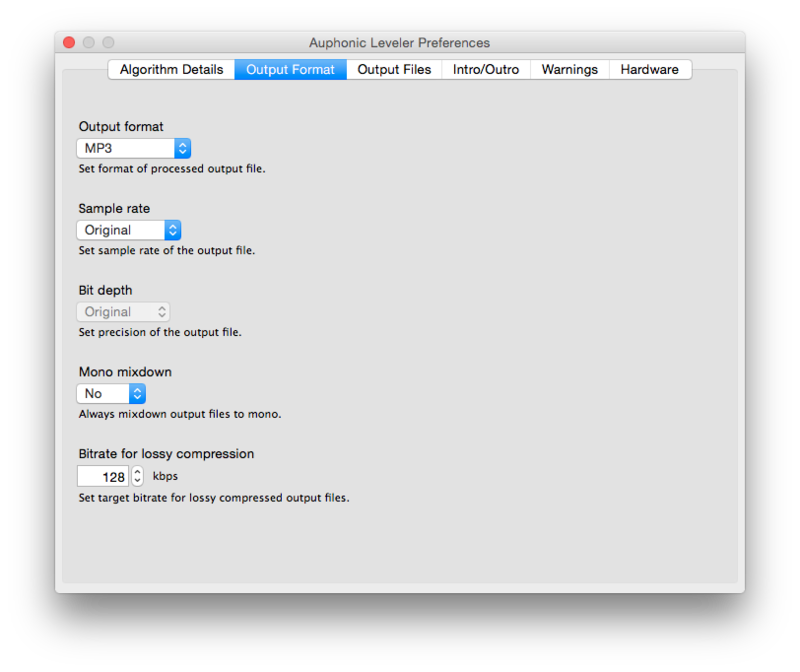 Set format of processed output file. Set sample rate of the output file. Set precision of the output file. 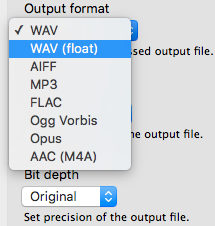 Always mixdown output files to mono. Set target bitrate for lossy compressed output files. It’s also possible to automatically export processing statistics (select box at the bottom). Will be appended to the processed output filename. Leave empty to put output files in input file folder. Select what should be done if an output file already exists. 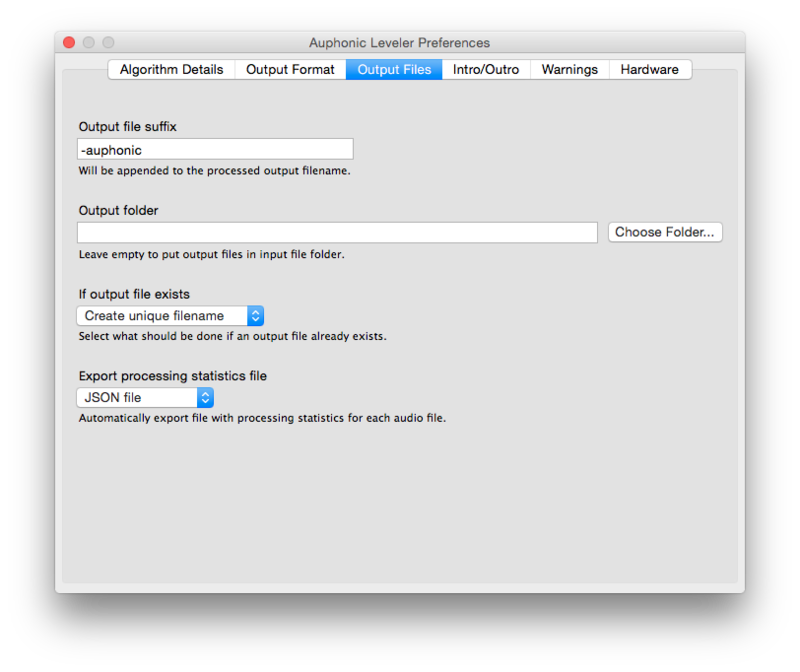 Automatically export file with processing statistics for each audio file. 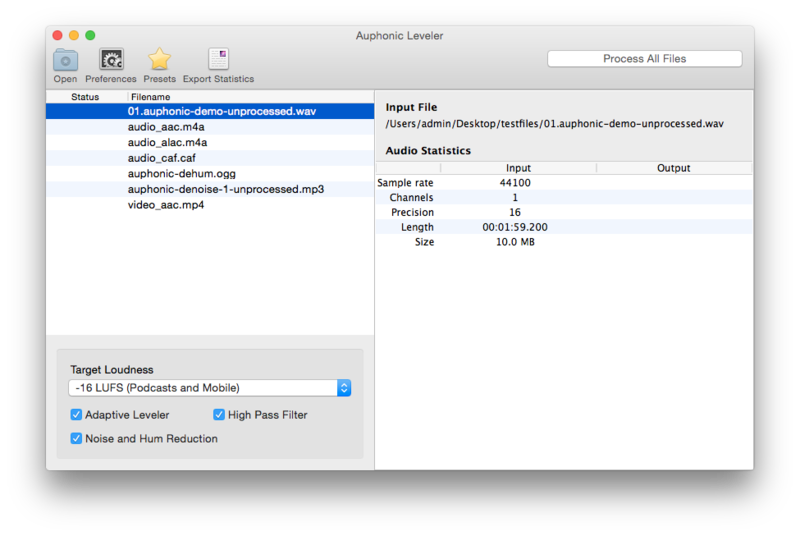 Select an intro audio file which will be prepended to all processed audio files. Leave empty to disable the intro file. 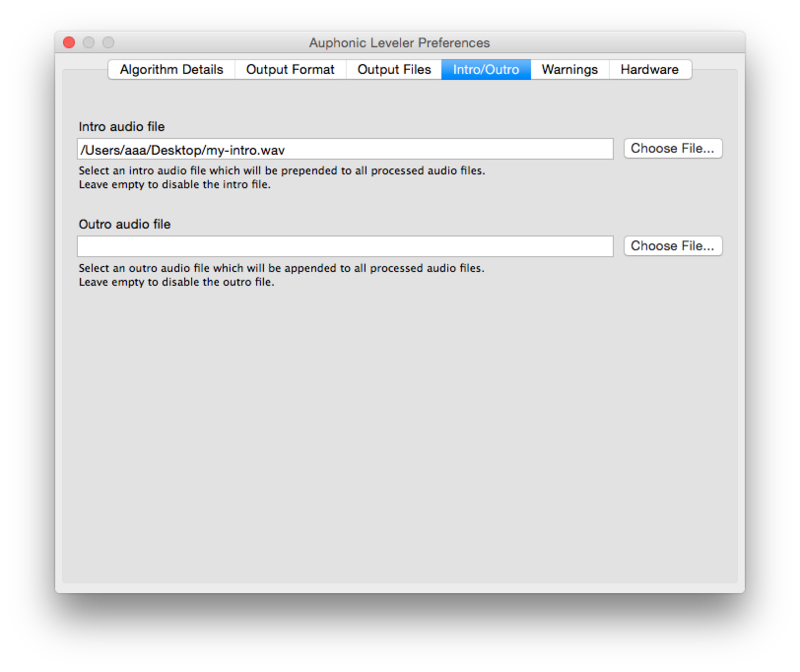 Select an outro audio file which will be appended to all processed audio files. Leave empty to disable the outro file. Warn if mean gain of the Adaptive Leveler exceeds threshold. Warn if input Signal-to-noise ratio is smaller than threshold. Warn if output Maximum Shortterm Loudness exceeds threshold. Warn if output Maximum Momentary Loudness exceeds threshold. Warn if output Loudness Range exceeds threshold. Max number of CPUs to use for parallel processing in our task queue. The higher the value, the more RAM is necessary. Please decrease if you get memory errors or system slowdowns! Temporary files will be created in this directory during processing (much faster on an SSD). Leave empty to use the default temporary directory of your operation system!